As BGCO Board members look on, Anthony Jordan, left, presents a wall hanging to Jo and Gene Downing, showing appreciation to the Downings for their $2.3 million gift toward work at Falls Creek. 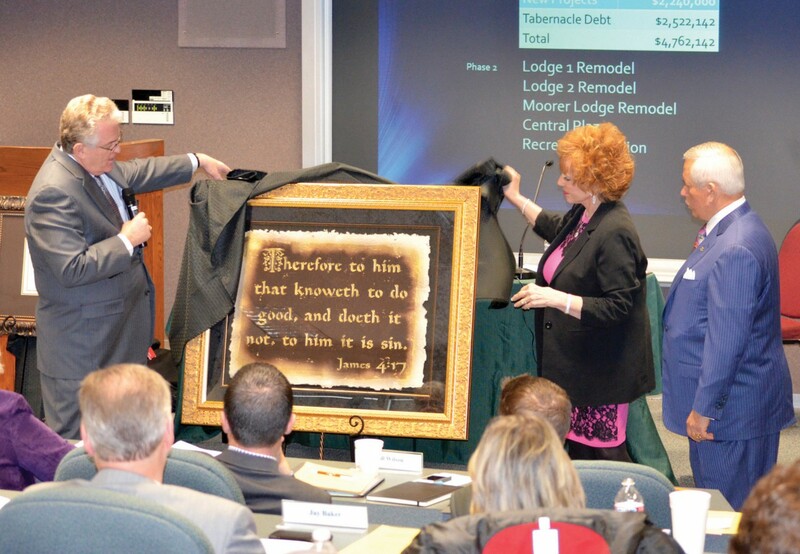 Board members of the Baptist General Convention of Oklahoma (BGCO) received an exciting announcement during their Feb. 25 meeting at the Baptist Building. Anthony L. Jordan, BGCO executive director-treasurer, shared news of a matching gift that would help eliminate the debt for building the new facilities at Falls Creek Conference Center in Davis. Gene and Jo Downing, longtime supporters of Oklahoma Baptist ministries, have committed to give $2.3 million as a matching gift, Jordan announced, toward the cost of construction of three new buildings at Falls Creek, including the Mathena Event Center, Thompson Lodge and Jordan Welcome Center, and tabernacle debt retirement. Downing has worked in various positions in the oil industry, and in 1980 established Downing Wellhead Equipment. Through ups and downs of the oil industry and the economy, the Downings remained focused on the three most important things in their lives—God, family and their local church. Downing gave a testimony to the board of his early experiences at Falls Creek. He expressed his excitement of having an event center and other facilities that would be beneficial for older adults, as well as a welcome center. “Through all of that dreaming and all of that praying, it’s great to see it come to fruition,” said Downing.